← XenDesktop 7, are XenApp Advanced customers left in the dark? Enjoyed reading this article. Thnx! Thanks Barry, great idea, would like to do that some time, let’s talk about that offline. Great article. I’ve been looking for more info on this subject as these new features have greatly skewed the density numbers for load testing. I work for a large server company running VDI load tests on our servers using LoginVSI. I noticed that when I went to XD7 by default my VSphere hosts would hit 100% CPU utilization at around 50- 60 machines logged in. In XD5.6 it was more like 200 machines before that would happen. I enabled the legacy graphics mode policy and i went from maxing out my host at 50-60 machines to running a full load of 160 machines and never coming close to max. Are there settings to address this? Is it just going to be the norm that with the graphics improvements of XD7 density will suffer greatly? Thanks and interesting results you got there. The results indeed shows the impact on the server scalability when using the CPU based compression codecs (default in XD7) on the other hand you win bandwidth gains and a better user experience but if CPU density is what you are after then you can switch back to the legacy graphics mode, which should give you about the same numbers as XD5.6 because it’s basically the same. Desktop composition redirection can also help to lower the impact on the CPU, but you need compatible Windows clients as this post describes. 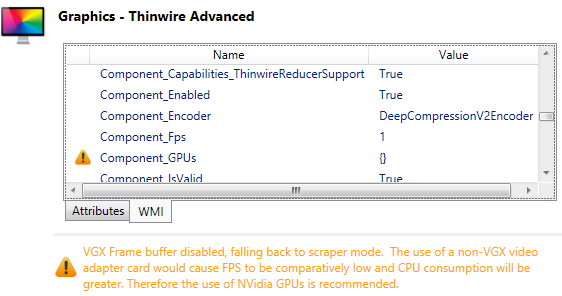 Other then that, you can place GPU’s in the server to offload the CPU. The latter will give you the best overall results but for now it’s still the most expensive option. But if you ask me GPU’s are going to be the standard for VDI deployments, it’s a matter of time till GPU virtualization goes more mainstream and the GPU’s become a bit cheaper. As with previous versions, this needs offloading to the client device as it hits the CPU very hard if its processed on the server. Any idea if this has been removed and what the recommendations would be to get more than 3 uesers on a server who stream flash videos at lunch time. Yes I hear you, hopefully Citrix will put it back in a future version. It looks like the second generation is enabled by default for XenDesktop 7 if you use the template policy to build from. Current apps that don’t work with this (any ecplise app) Epic, Louts Notes, Cisco Supervisor Desktop etc… basically if your deploying XenDesktop 7 use the gen 1 first. 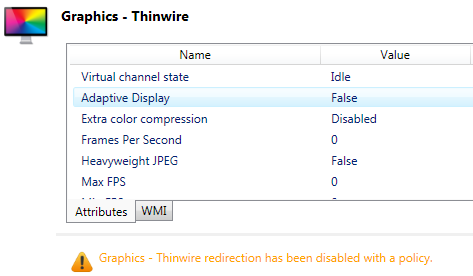 Can anyone point me to a document that spells out precisely which features/enhancements are lost when you enable Legacy Graphics Mode and disable Desktop Composition Redirection? We’re looking at Linux thin clients and our initial impression is that performance is much better when we enable Legacy mode. That said, we’d like to understand what we’re giving up. 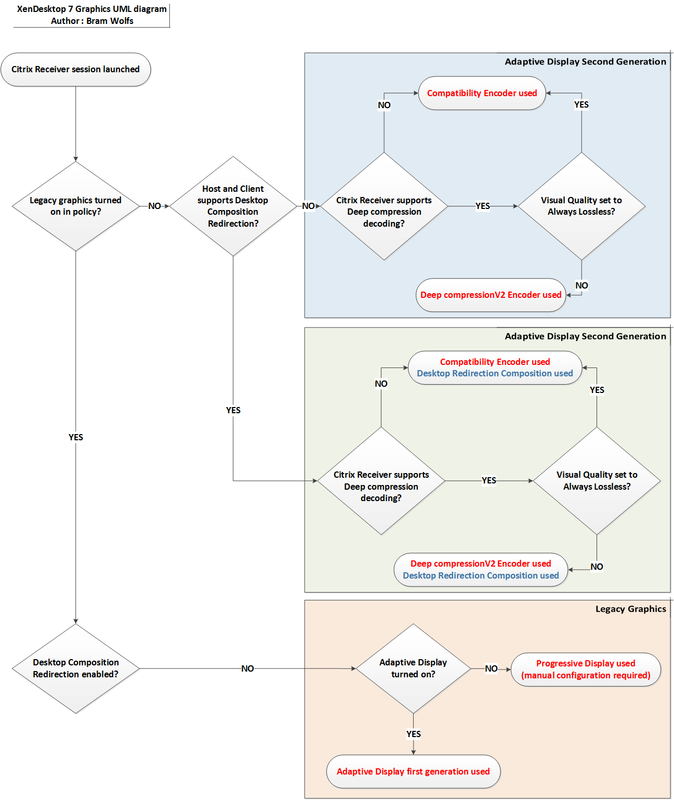 Desktop Composition Redirection is a non-starter when connecting from Linux so what, if anything, are we missing out on? Basically legacy mode is the collection name of all the previous used graphics technics, like adaptive display and progressive display. There is nothing wrong with legacy mode graphics, it’s stable and based on years of development etc. The thing you will loose when you stick to legacy mode is the new super codecs used in the new versions, and this has benefits particular in WAN scenarios. It looks like the receiver is a bit behind, so it maybe better to stick with legacy mode for the time being. We observed an issue when a local workstation, based on Windows XP, launches a XenDesktop 7.5 Session. The Desktop session will freeze if it is not in use for some time,with a gray desktop session window as result. Another issue seen on local pc’s with an ATI Radeon HD 3470 Graphical Interface Card and Citrix Receiver 14.0 (4.0.0.45893) or Citrix Receiver 14.1 (4.1.0.56461) is a black screen for the desktop session window if the session will be moved from a 19”(1680×1050) monitor to a second 17”(1280×1024) monitor (both connected to DVI). In previous XenDesktop 5.6 / Provisioning Servicves 6.1 environment we have not experienced this issue. The freeze problem only occurs when launching a Desktop Session from Windows XP workstations. Windows 7 and Windows 8 workstations do not have this problem and do not need the extra policy setting as workaround. Unfortunately it is not possible to create a policy based on a locally used OS, so the workaround will affect to all desktop sessions. – Citrix Provisioning Services Target Device x64 version 7.1.2.3 (7.1 SP2 Build 3). Hopefully the above helps other users with similar problems. Thank you very much for your interresting article – I enjoyed reading it and it really gave me some more ideas for our challenges. How would you recommend to set the graphic settings? I have the big issue, that the mouse pointer has some Latency/Delay when moving – that is a no-go in a CAD-environment. The latest V13 Linux Receiver should support the decompression of the new deep compression H.264 codecs. What I would do is put a Windows client with the latest Receiver aside and test\compare the config. 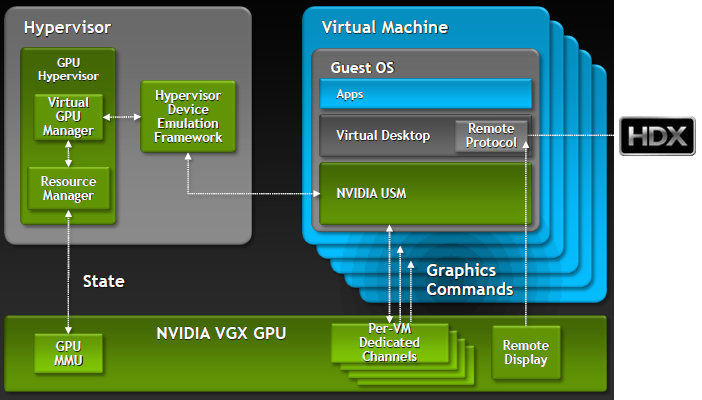 I would also run some GPU tests on the XenApp server to see how it leverages the GPU.